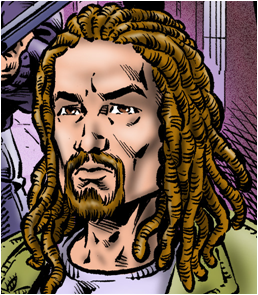 Christopher is the leader of the Underground for the Enhanced– an organization comprised of enhanced and standard (nonenhanced) individuals that advocates enhanced rights. Christopher has the ability to heal nearly anyone that is not dead. As long as there is an ounce of life in that particular individual, Christopher can bring them back. Christopher is limited to the number of people he can heal in a day as it requires extraordinary amounts of energy. Christopher named himself Pulpit as a tribute to his father who was a pastor. Though Christopher stays off the radar, he has ties with powerful people due to his former career with the federal government. He’s crossed paths with people such as William Walker (The Cataclysm), Fredrick Foit (Hustle), The Osirica, and Ulrich Anderssenn (Outlaw). His closest ties are with his girlfriend, Lauren Lucid, and the vigilante named “Donovan”.